Published April 17, 2018 | By National Aperture, Inc. In many applications like Multi-Axis Positioning, Lens Focusing, Precision Optical Alignment and Laser Machining motorized positioning may not always be practical because of their size, the interference from the motor connections and the substantial increase in cost for the motorized stages plus the controllers/drivers. In these cases, manual positioning stages may be ideal. Often Manual Stages are overlooked because typical stages can’t travel beyond 12.5mm. The NEW National Aperture, Inc. MM-3CR-1X Series Stages however has 25mm of linear travel and is a perfect alternative to motorized positioners. Contact us today for more information about our NEW MM-1CR-1X Series Manual Stage. Published March 15, 2017 | By National Aperture, Inc. In many applications such as laser machining, semiconductor manufacturing and microscopy it is very advantageous to have a low profile fast travel stage with a large thru aperture. Issues such as Resolution, Repeatability and Accuracy are always of great concern and the NEW National Aperture, Inc. MM-5M Motorized Scanning Stage ranks very high in the fulfilling these requirements. Multiple axis such as X, XY, XZ and XYZ are very useful and this new stage is available in any of these configurations. 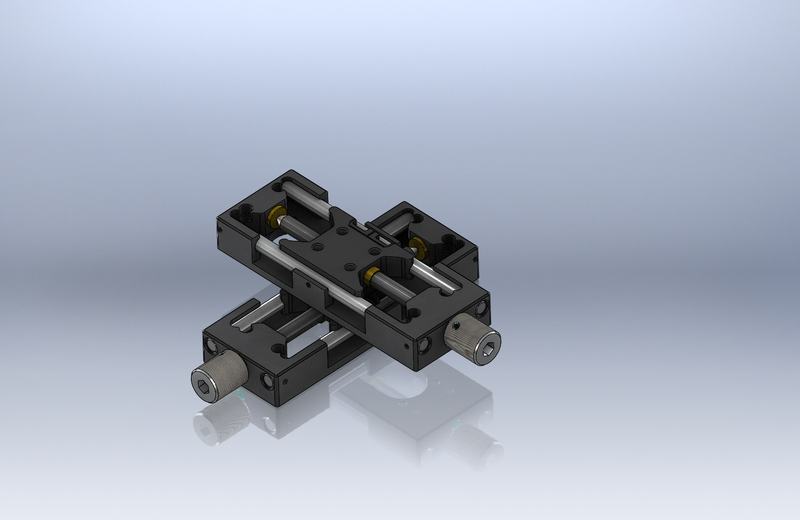 The new stage is servo motor driven with a linear travel of 25mm and a max speed of 39mm/second. The MM-5M is a low profile linear stage (139mm X 67mm X 14mm) with a large thru aperture of 53mm X 28mm and resolution of 1.56µm/motor encoder count. The MM-5M is available X, XY or XYZ configurations and is ideal for precision laser machining, semiconductor applications, microscopy and much more. Contact us today for more information about our MM-5M Scanning Linear Stage.